The Refugee Youth Movement, on Monday, held a protest outside the main UNRWA office in Bethlehem, against the reductions in the agency’s services, after US president DonaldTrump’s administration cut its funding. According to the PNN, the participants raised banners protesting the cuts and recent US resolutions impacting the rights of Palestinian refugees. Protesters included students and teachers who called for fortifying the education services and halting decisions to lay off teachers, improving classes, and activating the operating system to reduce unemployment among refugee youth, as well as improving the quality of health services. 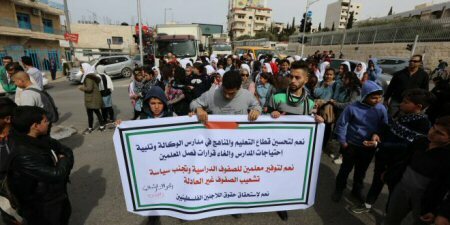 The protesters stressed that the rights of Palestinian refugees are a red line that can not be crossed, and the need to resolve the issue of refugees in accordance with the resolutions of international legitimacy. The movement also called on the Palestinian Authority and UNRWA to respond, as soon as possible, to the urgency of the current situation. For his part, Mohammed Abu Aker said that the youth movement rejects the American cuts and resolutions, and demands a dignified life, providing health transfers and education to ensure the future of our children without blackmailing the Palestinian people.